Hello fellow land dwelling friends! We are back from our vacation where we went on another Disney Cruise! We have done a few now and they have been the best trips our family has ever been on. This was our first voyage on one of the classic ships. Can not recommend enough! This was the longest cruise we have done, and I took the most footage ever. It will take me a little bit to sort through it all! I plan on several blog posts and a video. I can't decide whether to divide it up by day or category (food, entertainment, ports, etc) so I'm open to any and all suggestions! 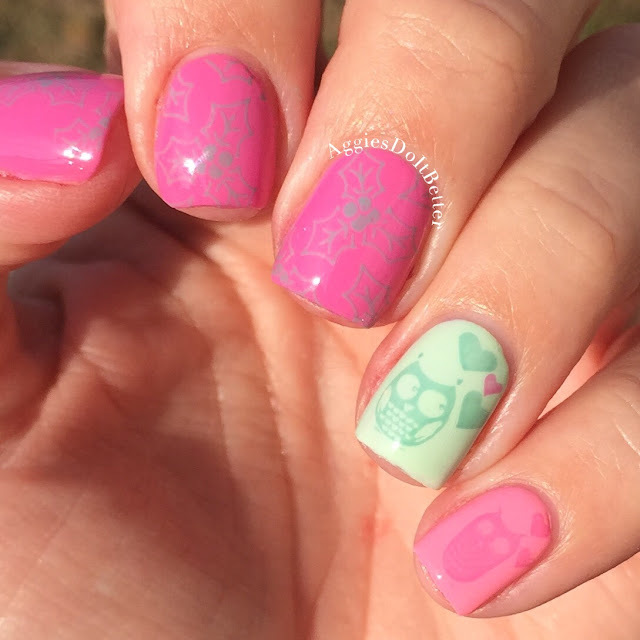 I'm starting today with the mani I created and wore the whole time! I was really indecisive about what to do, and therefore waited until the last minute to do these nails and was up entirely too late the night before we left! Once I finally decided on a color palette this is what followed, 2 hours later! Hello! Like I said before, even though it's after Christmas I still have plenty of holiday things to post. After this one I have maybeeeee 3 or 4 more Lush Holiday items to post about (some I haven't even used yet! For shame!) so those will be coming soon. I'm going to try to get them up by the end of January. Today I have the Father Christmas bath bomb. It's pretty cute...can you get any more Christmassy??? 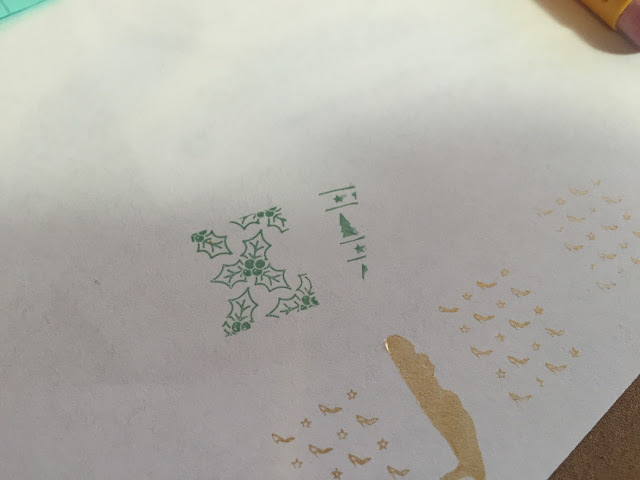 I did capture one image of the fail just so y'all can see how bad I am at stamping and not laugh at when I get excited about doing a good job once in a while! On to the bath bomb....Father Christmas shares a scent with the "Snow Fairy" family, which I am not familiar with at all. It does have a really sweet, candy like strawberry scent. Which is fine for me once in a while, but not on the regular. I have really gotten away from that sort of scent. I'm glad I bought this one but I'm not sure it will be a repurchase for me next year! It was really quite beautiful...the pale pink exterior revealed a vibrant green inside. I apologize for the dimness of the photos, the lighting in my bathroom is terrible! I'm not sure if using my flash will help but I'm going to work on it. Check out the little video of Father Christmas in Action, and please subscribe to my channel to see more! The water was an excellent shade of green and did not stain my tub, which was a huge plus! Hello! I know it's after Christmas but I still have holiday things to post :) Today I have a mani I did well before Christmas but never got to write about it and post it. I got the idea to do different holiday themes of my most popular mani ever, my Mickey nails! You can see the original post HERE from 2014 way back from 3 years ago! (don't laugh at them) And then my Thanksgiving 2016 version here. Today I have the Christmas version! The Minnie themed polishes are from the OPI Minnie Couture collection that came out a few years ago, I only have a few from that collection and a set of mini's. I wish I had them all! What is the next holiday coming up...Valentine's Day? I need to start working on that design! 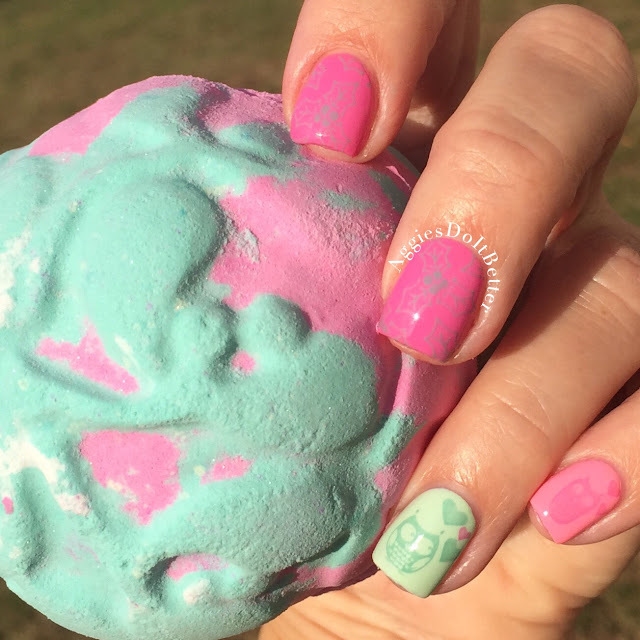 Today I have more information on the inspired nail art from the Lush Mistletoe bath bomb I posted about yesterday! 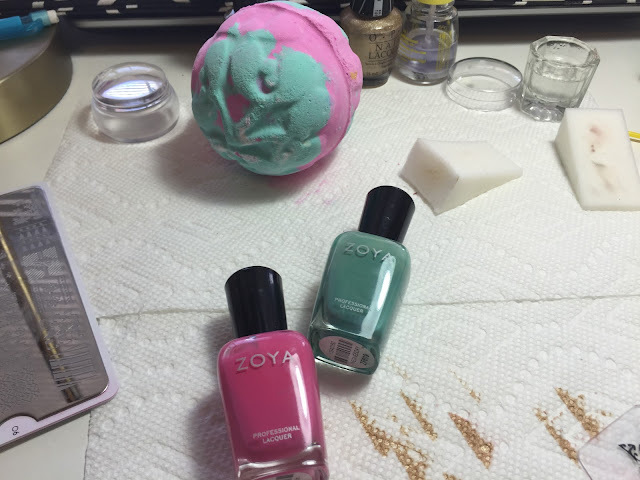 I chose Zoya Eden for the darker pink and Zoya Wednesday for the darker green. The lighter green is Zoya Tiana and the lighter pink is Zoya Kitridge. I stamped with Eden and Wednesday, they worked pretty well! Here's another look at my typical yet messy setup. 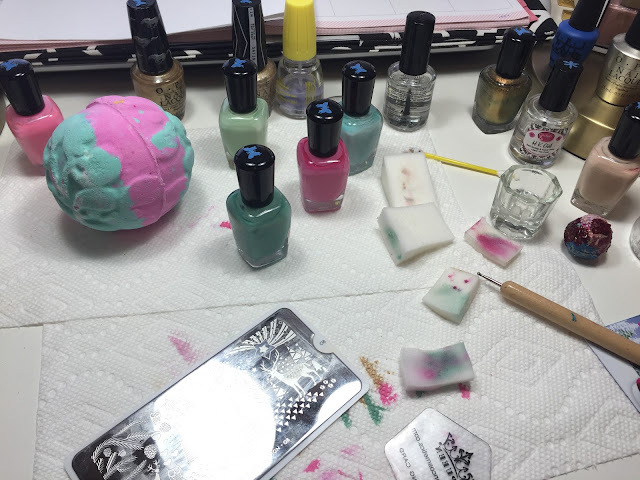 I set out the bath bomb and comb though my polishes for matching colors. 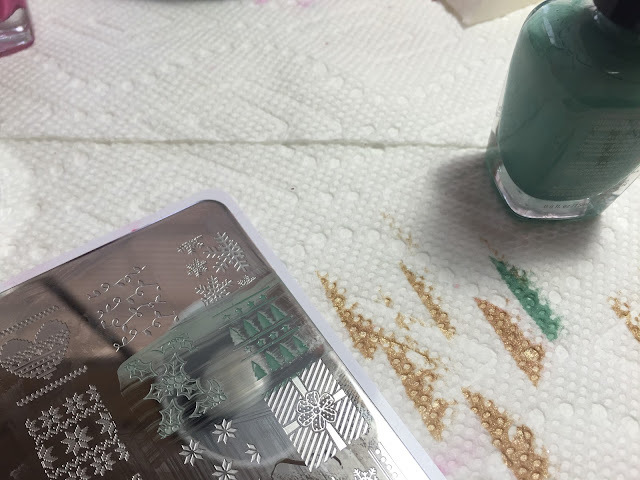 I also have to try out each polish to find ones that stamp well since I don't have "stamping" polishes, and sometimes I have to pick out other colors that are more opaque. The plates I used are Moyou festive collection 08 for the owls and hearts and Moyou Festive Collection 06 for the holly. I don't have a plate that has mistletoe on it, plus holly is cuter anyway! Hello! I'm still working on going through all the content I have and getting it posted! These Lush posts are more work than a regular post because I have to produce the coordinating nail look, then get around to using the product and then posting about both here! I wish I could have gotten through it all before Christmas but I'm only one person with so much time! I will continue to post these as I get through them even after Christmas. AND, I have a few other items that aren't holiday-ish I want to review as well! I really like this little theme so I'm going to keep up with it until I get tired of it, haha. Today I have the Mistletoe bath bomb, which is new this year. 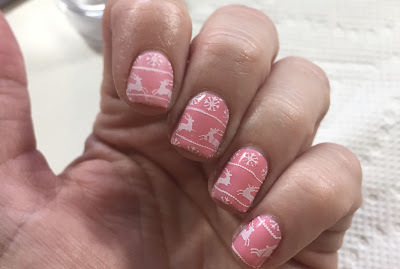 On my nails is more of a holly design, which isn't exactly the same thing, but it will work! I thought some cute owls looking at each other lovingly would be a nice touch. I'll have more on that tomorrow. The Mistletoe bath bomb is a really pretty combination of colors and it fun to watch. The scent is very jasmine-y which apparently I don't like very much. 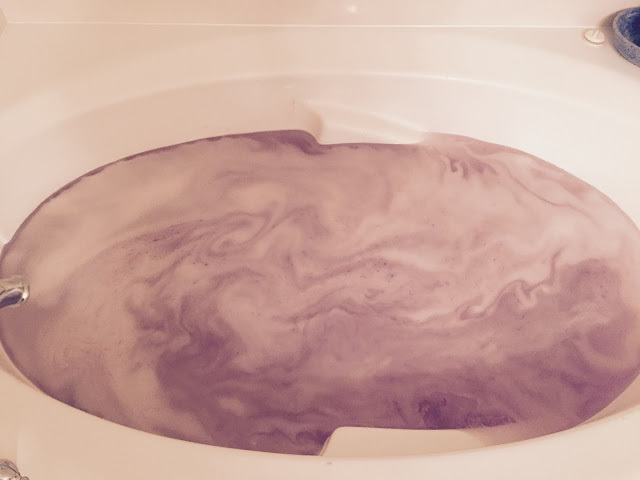 This bath bomb was a little to "musky" for me. It made gorgeous bright fuchsia patterns in the water! The water was a really nice purpley pink shade. All in all, this bath bomb would not be a repurchase for me, and I know know that anything with jasmine in it I probably wouldn't like. It is really pretty though and would be a great Christmas present for anyone in to jasmine or musky scents!